Bonded to be adopted together, adoption fee is for both. 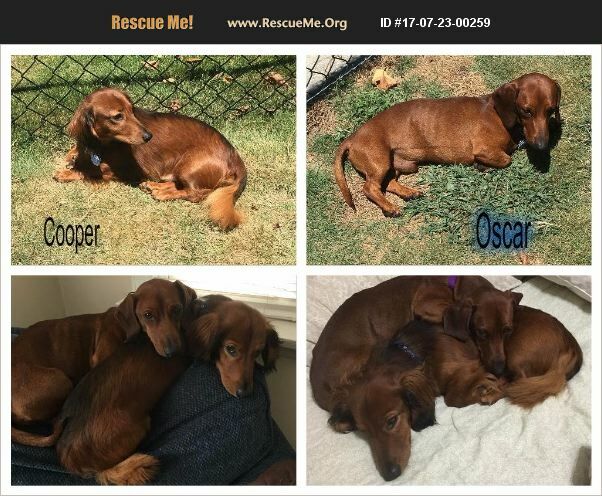 Cooper and Oscar were abandoned in an apartment together by their owner. They are up to date on all vaccines, microchipped, neutered and on heartworm preventives. Cooper is the longhaired at about 17lbs and about 3 years old. Oscar is smooth haired at about 15lbs, should be about 17 working on that, he is about 19 months. Cooper and Oscar play wonderfully together, mostly house trained when let out on a regularly. Cooper is very shy and fearful to begin with and would rather they not go to a home with small kids. He loves to be loved on as both do. Fenced yard is required as they like to run. We do not adopt outside of NC. For our adoption application please email us.